The Story of "The Free State of Jones"
The people who settled Jones County never became wealthy people. When they arrived in the county, these settlers found a land heavily forested with virgin pines. Any forester can attest that pine trees prefer to grow in sandy, acidic soil. Any farmer can also attest that large-scale agriculture does not do well this type of soil. So, the early settlers of Jones County were never able to create large plantations as they had in other regions of Mississippi. They relied instead on small family plots to grow enough vegetables for their own use to supplement the game that they hunted in the forest. In addition, their cattle were allowed to free-range, meaning that herds of swine and cows were branded by individual herders and then allowed to roam freely in the forest to forage for food. No enclosed pastureland, barns, or herd-feedings were required by free-ranging. Most Jones County citizens, therefore, required no labor from slaves. They were able to work their small farms by themselves and they required no help in herding their cattle. Slaves did exist in Jones County in Antebellum times, but most of these were were owned by a few individuals who used them as house servants or hired them out to larger land-holders north of the county where the land would sustain such business. In all, there were just over 100 slaves that lived in the entire county in 1860. The debate over the role of slavery in the economy of the county, therefore, meant very little to the ordinary citizen of Jones County. It mattered very little, one way or the other, if slavery prospered or died. Some of them even viewed slavery as an institution designed to benefit only a few wealthy men at the expense of every one else. They believed that a man who relied on the labor of others was a man who was living beyond his own means, a shameful situation that they believed was paramount to sin. The idea of forcing human beings to work against their will was not the sin here. The sin was that men attempted to live and prosper by means greater than his own labor could provide. So, as the national debate over slavery became increasingly violent and talk of secession threatened to divide the nation, most of the ordinary citizens of Jones County had little sympathy for the idea. When the time came for Mississippi to decide whether or not it would stay in the Union or secede, the Jones County delegate to the Secession Convention in Jackson, J.D. Powell, was instructed to vote against secession. Once in Jackson, however, Powell found an atmosphere of excitement and patriotic ferver in favor of leaving the Union. In this atmosphere, Powell succumbed to the secessionist fervor and voted in favor. When the anti-secessionists of Jones County heard this, Powell was burned in effigy in Ellisville. When war erupted, however, most of the men of Jones County prepared to defend their homes and their land. valor on the battlefield, so we can assume that Knight was a fairly good soldier. At this point in time, Knight's military career was progressing much like that of other volunteers. away by the wealthy men running the war. So, during the retreat to Abbeville following the Battle of Corinth, he deserted and was listed as "lost" on 29 November 1862. He was soon captured, however, and was court-martialed. His rank was reduced to private and he was mustered back into duty in February 1863. Sometime before his unit arrived for duty in Vicksburg he was missing again. Thus, Newt Knight exchanged his career as a soldier for that of a renegade and would-be state maker. He headed back for home where he knew he could hide out in the swamps from the men that surely would be sent after him and other deserters. miles from the sea and has only one river that is not navigable by any vessel larger than a shallow raft. Once this was accomplished, the government of the Free State of Jones waged war against the Confederacy. Some versions of the myth state that Knight's army also waged war against any Union forces that may have come within the vicinity of the county. Once the Confederacy was vanquished by the Federal army and was returned to the Union, the Free State of Jones also ceased to exist. Knight's rebellion gave rise to the myth of the Free State of Jones and the notion that Jones County was completely disloyal to both Mississippi and the Confederacy, the great majority of the men of the county served the Confederacy honorably, whether by volunteer service or by conscription. They may have mumbled under their breaths about the elitist nature of the war and questioned its relevance in their own lives, but they served their country regardless and they served it well. amnesty to any deserter who would accept it. The amnesty would become effective 20 days from the decree's first reading in any given state. The person entrusted to carry out the amnesty in Jones County was a native son by the name of Major Amos McLemore. Once in Jones County, Maj. McLemore set up headquarters in the home of Amos Deason, a loyal Confederate citizen of Ellisville. McLemore set up collection stations throughout the county to which his men could report for duty and fugitive hunters could deposit the deserters that they captured for repatriation. The repatriated men collected in Jones County included those who took advantage of the amnesty as well as those who did not go voluntarily. In all, McLemore was successful in rounding up 119 men. room and found the Major standing by the fireplace. Knight shot McLemore at point-blank range through the heart before escaping into the woods and swamps surrounding the small town. were unsuccessful. The fact that he was being hunted may have led Knight to offer the services of his men to a small unit of the United States Infantry located in Jones County at a place called Sall's Battery. No proof, however, exists that they were ever incorporated into the Union Army. Surely, however, the Federals encouraged them to continue their molestation of the Confederate Army and sent them out to do so with Lincoln's blessings, perhaps with the misguided impression that they were now Federal agents. Finally, the war required that the Confederates end their pursuit for Knight. The Confederacy was desperately short of men for the battlefield and could not afford to have any performing non-military duties, including fugitive hunting. Word of the Federal encouragement for Knight eventually arrived, through many parties, into the hands of Gen. W.T. Sherman. As is the case when information is passed down from one party to the next, the facts surrounding McLemore's assassination, as well as the facts surrounding the level of organization of the Knight Company and the level of the organization of a supposed government initiated to rebel against the Rebellion were all exaggerated as they passed from one ear to the next. From Sherman and his agents, the story was given to pro-Union journalists in Natchez who seized upon the whole plot as propaganda. Having previously heard of the term "The Free State of Jones," these Natchez journalists succeeded in pulling all of the various plots and threads together to create a single piece of fiction. Thus, the myth of the Free State of Jones as a creation of Newt Knight - deserter, renegade, and assassin - was born. likely, the people simply found themselves to be in no need of a government at all. When so many of them left the county for more enticive land in the Chickasaw Cession, the original officers of the county quit their services because of a lack of pay and for many years the county had no legal government whatsoever. This situation continued until 1846 when the state legislature took action to reorganize the county's government. 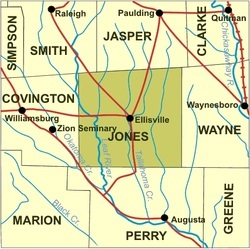 It was during this lawless era that Jones County gained the reputation of preferring anarchy to organized rule, and it was during this period that the term "Free State of Jones" was first applied to the county. The myth associated with the Free State of Jones arising out of Knight's actions was an embellished afterthought to be used for political propaganda. The Pro-Union journalists of Natchez wished to portray Newt Knight and his band of outlaws as the comical representative of all that can go wrong when laissez-faire, decentralized government is allowed to go amuck. The Northern propagandists in Natchez and New Orleans used the news of his lawlessness - and the county's reputation for the preference for anarchy - as a tool of mockery against all that the Confederacy represented. Knight served as an illustration of what happens when decentralized government goes too far. The comedy that the propagandists made of his story was not lost on their Northern and Pro-Union readers. It was, however, lost on the common man of the South. For them, Knight became a hero figure, much like Robin Hood and his Merry Men. In their minds, if Knight was someone for the Yankees to mock, then he must be good. In spite of the anti-Confederate attitudes of these men, the common people of Mississippi, especially of Jones County, embraced the spirit of Knight as representative of their own sense of independence. It is not at all different in the way some Southerners today still embrace that which they perceive to have been the spirit for which the Confederacy fought: chivalry, honor, independence, and rebellion against tyranny imposed by less reasonable people. This spirit, personified in the myth of the Free State of Jones, still exists today and is even celebrated in quasi-legal terms. The slogan "The Free State of Jones" is often seen embossed on official stationary of the county government. It is seen on the cruisers of the Jones County Sheriff's Department and is incorporated on the uniform sleeve patches worn by the sheriff's deputies. became an outlaw. Perhaps the Natchez propagandists had it right when they mocked the situation in Jones County with their tales of secession and rebellion against the Rebellion. Yet, it is very easy for people who are removed by time and circumstances to misunderstand the reasons behind the deeds of people who lived before them. Americans, particularly Southerners, have a habit of glorifying their past in ways that are not exactly historically accurate. The Myth of the Free State of Jones is but a local example of this error. Regardless of the truth, the tale of Newt Knight and the Free State of Jones does make an entertaining story.